EUAGORAS II, c. 368–351 b.c. Alexander the Great , 332–323 b.c. ANTIGONUS /, 323–301 b.c. and DEMETRIUS POLIORCETES 306–295 b.c. PTOLEMY I (SOTER), 323–285 b.c. PTOLEMY II (PHILADELPHUS), 285–246 b.c. PTOLEMY III (EUERGETES), 246–221 b.c. PTOLEMY IV (PHILOPATER), 221–204 b.c. PTOLEMY V (EPIPHANES), 203–181 b.c. PTOLEMY VI (PHILOMETOR), 181–146 b.c. PTOLEMY VIII (EUERGETES II), 170–116 b.c. PTOLEMY X (SOTER II, LATHYRUS), 116–80 b.c. PTOLEMY XI (ALEXANDER I), 114–88 B.C. PTOLEMY XIII (NEOS DIONYSOS) 80–58 b.c. and 55–51 b.c. CLEOPATRA VII AND PTOLEMY XIV, XV AND XVI 51-30 b.c. Broadway Between 155th & 156th Streets New York 32, N.Y.
Theodore V. Buttrey, Jr .
Any work related to the Curium excavations of the University Museum owes its greatest debt to George H. McFadden whose enthusiasm and support made their continued operation possible. His tragic death in a sailing accident off Cyprus in 1953 brought the excavations to a close. Thanks are gratefully extended to the Department of Antiquities in Cyprus for sending the coins on loan to the United States for study, and particularly to Mr. A. H. S. Megaw, director of the department, for his personal interest and cooperation. I am again indebted to Mr. James T. Babb, Librarian of Yale University, for putting a room and the facilities of the library at my disposal. There I was fortunate in having Professor A. R. Bellinger at hand. He has not only helped in reading the manuscript and offering valuable suggestions, but relieved me by identifying several hundred Roman coins, at the same time making notes which I have used freely. To my friend Miss Margaret Thompson I am grateful for her critical and most helpful reading of the Greek section of the manuscript. Finally it is a pleasure to thank Mr. G. K. Jenkins and Dr. J. P. C. Kent of the British Museum for willingly answering questions, and to acknowledge my debt to Professor Philip Grierson of Gonville and Caius College, Cambridge, who has generously permitted me to make extensive use of his unpublished notes. The ancient Kurion or Curium, the form more commonly used in numismatic literature, lies on the south coast of Cyprus, west of Limassol on the road to Paphos and near the modern village of Episcopi. Here excavations were carried out under the auspices of the University Museum of Philadelphia between 1932 and 1953 with a break of about ten years during the war and its aftermath. The coins from that excavation are here catalogued, surface finds dated after 1600 A.D. excepted. The site, inhabited from the bronze age to the present, is spread out along six kilometers of road. To the east of Episcopi are the prehistoric sites of Ermani and Bamboula. Both of these areas produced some coins showing habitation also in historic times. West of the village on a cliff overlooking the sea stands the Roman citadel with baths and theatre adjacent. Somewhat farther west and a little inland is the stadium. From these areas the coins were largely Roman. At the most westerly point explored is the ancient sanctuary of Apollo Hylates. This site produced the earliest of the coins found and also the majority of all the Greek coins unearthed. Although occupied from the eighth century b.c. to about the end of the fourth a.d. there was little stratification of use in dating the coins. In fact, nowhere at Curium was there important stratification, nothing to show the growth or decline of the city. Scattered as the soundings were over a long stretch of road and many kilometers of water-sytem, no real continuity emerged. The coins represent only phases in the life of the city. Their relative numbers can give no indication of the importance of the place at different times. Their significance lies almost wholly in their being found at Curium. It has long been postulated that during the reign of Euagoras I in the early fourth century b.c. there was a mint at Curium producing silver staters and fractions. None of these silver coins was found, but some small bronzes possibly contemporary with the silver and other bronzes from the time of Euagoras II seem to confirm the fact that there was such a mint. The bulk of the Greek coins from the excavations was Ptolemaic from the mint of Paphos. These support to a remarkable degree the attributions made by Svoronos in his monumental work on the coins of the Ptolemies. Poole earlier in the British Museum catalogue, Coins of the Ptolemies, and Regling in his review of Svoronos' work contributed other identifications. The Curium coins add little to the combined work of these three scholars beyond probable confirmation of one or the other. The Roman coins, more self-explanatory than the Greek, present few problems that their presence in Cyprus might solve. No coins of the Roman Republic were found. Among the imperial coins there are comparatively few specimens from the Cyprus mint, the majority are imported from Rome and various Asia Minor mints. The proportion of coins of large denomination is exceptionally high and three bronze medallions further emphasize the Cypriotes' apparent predilection for large money. The coins throw little new light on the trade relations of Curium. It is known that the Jews did a lively business in Cyprus in the first centuries b.c. and a.d., and this the number of Jewish coins confirms. But from places more remote than Syria or Palestine only single coins were found. The four small coins from Cyzicus are the exception. The fourth century Roman coins struck at Asia Minor mints seem indicative of Roman fiscal policy, not trade. The later coins too are not without interest. Quantities of small sixth century coins were found in exploring a water-system completed in the time of Justinian. Among these were a few coins of the Vandals and Ostrogoths. The later Byzantine coins, although few in number, may be of help in clearing up the vexed question of a mint for Con- stans II in Cyprus. The coins of the medieval kings of Cyprus are all surface finds. Few Arabic coins were found and none included in the catalogue. Coins marked with asterisks in the Catalogue are more fully described and commented upon in the Commentary following. Antioch , iv Dorothy B. Waage, Antioch-on-the-Orontes, vol. ii, IV, part two: Greek, Roman, Byzantine and Crusaders' Coins (Princeton, 1952). Ath. Agora, ii Margaret Thompson, The Athenian Agora, vol. ii, Coins from the Roman through the Byzantine Period (Princeton, 1954). BMC A Catalogue of the Coins in the British Museum. Arabia G. F. Hill, Arabia, Mesopotamia and Persia (1922). Attica B. V. Head, Attica-Megaris-Aegina (1888). Caria B. V. Head, Caria, Cos, Rhodes, etc. (1889). Cyprus G. F. Hill, Cyprus (1904). Galatia Warwick Wroth, Galatia, Cappadocia and Syria (1899). Ionia B. V. Head, Ionia (1892). Lycaonia G. F. Hill, Lycaonia, Isauria and Cilicia (1900). Lycia G. F. Hill, Lycia, Pamphylia and Pisidia (1894). Mysia Warwick Wroth, Mysia (1892). Palestine G. F. Hill, Palestine (1914). Phoenicia G. F. Hill, Phoenica (1910). Pontus Warwick Wroth, Pontus, Paphlagonia, Bithynia, and the Kingdom of Bosphorus (1889). Ptolemies R. S. Poole, The Ptolemies, Kings of Egypt (1883). Troas Warwick Wroth, Troas, Aeolis and Lesbos (1894). CRE H. Mattingly, Coins of the Roman Empire (1923-). Vandals Warwick Wroth, Coins of the Vandals, Ostrogoths and Lombards and of the Empires of Thessalonica, Nicia and Trebizond (1911). Byz. Warwick Wroth, Imperial Byzantine Coins (1908). Babelon Catalogue des monnaies grecques de la Bibliothèque Nationale. Perses Achéménides, Ernest Babelon, Les Perses Achéménides (1893). Rois de Syrie, Ernest Babelon, Les rois de Syrie, d'Arménie et de la Commagène (1890). 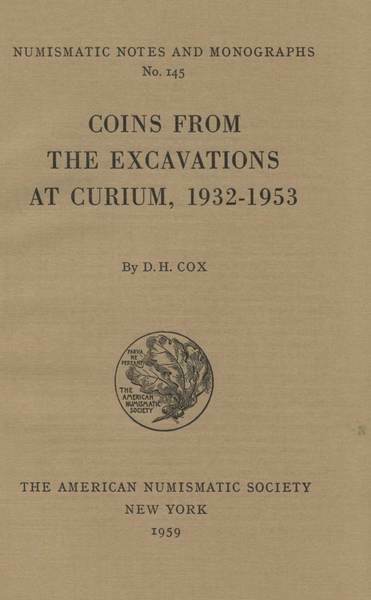 Bellinger Dura vi, A. R. Bellinger, The Excavations at Dura-Europos Final Report VI, The Coins (1949). C. H. Cohen, Description historique des monnaies frappées sous l'Empire romain, 2nd edition (1880–1892). Dattari G. Dattari, Numi Augg. Alexandrini. Catalogo della Collezione G. Dattari (Cairo, 1910). Giesecke W. Giesecke, Das Ptolemäer Geld (Leipzig, 1935). Gnecchi F. Gnecchi, I Medaglioni Romani (Milan, 1912). Grant FITA Michael Grant, From Imperium to Auctoritas, (Cambridge, 1946). SMAC Michael Grant, The Six Main Aes Coinages of Augustus, (Edinburgh, 1953). CTC Michael Grant, The Coinage of Tiberius in Cyprus , (University of Melbourn, 1957). Im.-B. Ka.M. F. Imhoof-Blumer, Kleinasiatische Münzen (Vienna, 1901–02). M.G. F. Imhoof-Blumer, Monnaies grecques (Amsterdam, 1883). M. J. Maurice, Numismatique constantinienne (Paris, 1908–1912). Madden F. W. Madden, Coins of the Jews (London, 1881). Mionnet T. E. Mionnet, Description de médailles antiques grecques et romaines (1806–1837). Newell C. of D. P., E. T. Newell, The Coinages of Demetrius Poliorcetes (London, 1927). SMA, E. T. Newell, The Seleucid Mint of Antioch (New York, 1918). WSM, E. T. Newell, The Coinages of the Western Seleucid Mints from Seleucus I to Antiochus III (New York, 1941). RIC H. Mattingly, E. A. Sydenham, C. Η. V. Sutherland and R. A. G. Carson, The Roman Imperial Coinage (London, 1923- ). Sabatier J. Sabatier, Description générale des monnaies byzantines (Paris, 1862). Sch. G. Schlumberger, Numismatique de l'Orient latin (Paris, 1878). Sv. I. N. Svoronos, Τὰ νομίσματα τοῦ χράτους τῶν Πτολεμαίων (Athens, 1904–1908). Sv. iv Volume iv of the above work contains a German translation of Svoronos' original commentary in vol. i, also a reprint of Kurt Regling's review of vols. i–iii first published in ZfN, XXV, 1906, pp. 344ff. Both the commentary and the review are quoted as they appear here. Tolstoi J. Tolstoi, Monnaies byzantines (St. Petersburg, 1913–1914). 16, 17 mm. cf. Sv. 79ff. 27 mm. cf. Sv. 289ff. 13 mm. cf. Sv. 216f. PTOLEMY XI (Alexander I) 114–88 B.C. Century b.c. rev: Zeus stg. l., in r. one or two ears of grain, in l. sceptre; star above head. rev: Head of Augustus r. rad. ; star above, thunderbolt to r.
24 mm. ibid. p. 74, 5f. 35, 36 mm. ibid. p. 75, 12f. 27 mm. ibid. p. 85, 52f. 17 mm. cf. BMC Peloponnesus, p. 55, 234f. 13, 14 mm. BMC Mysia, p. 41, 173f. 10 mm. BMC Caria, p. 238, 74ff. 19 mm. cf. ibid. p. 168, 1302ff. 18–21 mm. ibid. p. 203, 426ff. 18 mm. ibid. p. 204, 438 ff. 18 mm. ibid. p. 262, 105ff. Century a.d. 11, 12 mm. BMC Phoenicia, p. 56, 27ff. 24 mm. ibid. p. 68, 109f. 30 mm. ibid. pp. 223f., 118f. 14 mm. BMC Palestine, p. 202, 30ff. 14 mm. ibid. p. 207, 61ff. 17 mm. ibid. p. 232, 10ff. 15 mm. ibid. p. 257, 54ff. 16–18 mm. ibid. p. 236, 1ff. 15, 16 mm. BMC Palestine, p. 261, 1ff. 16 mm. ibid. p. 267, 15ff. 17, 18 mm. ibid. p. 272, 22ff. 19 mm. ibid. p. 85, 16ff. 13 mm. Dattari, p. 80, 1213ff. As BMC, i, p. 117, 731ff. As BMC, i, pp. 142f., 161f. Ses. BMC, iii, p. 164, 772f. Den. BMC, iv, p. 394, 58ff. As cf. BMC, iv, p. 196, 1221ff. Den. BMC, iv, p. 56, 373ff. Ses. BMC, iv, pp. 560f., 1092ff. Ses. BMC, iv, p. 646, 1537f. Ses. BMC, iv, p. 678, 1699f. Den. BMC, v, p. 218, 335ff. Ses. BMC, V, p. 307, 764f. Ses. cf. RIC, iv (3), p. 171, 103f. Æ 2 cf. C., 17ff.